Old Bronze Coin. 18 mm diameter, 2.3 gms. Obv: Some bloke. Rev: Two blokes fighting. Good Fine, $30. Above we have a photo of a bronze ancient coin, the sort that could easily be picked up from almost any coin store for about $30. What can we tell from this coin? To the untrained eye it looks like an ancient coin with the head of man on the front, and two men fighting on the back. But how old is it? Who minted it? Is it Roman, Greek, Biblical, Persian? With a bit of knowledge, and some good books at hand, we can dig deeper. This gives us the first clue as to the nature of this coin. All the letters, though they might look slightly different to our fonts, are letters of our Alphabet. There are no Greek letters, or other stranger characters. This indicates that our coin is Roman. DN stands for Dominus Noster, or “Our Lord”. The Romans were very cautious about calling anyone “Lord” and clung to their idea of Republicanism and liberty for as long as possible. We have reports that the Emperor Aurelian (270-275 AD) and other emperors styled themselves as “Lord”, but their coinage does not reflect this. The titles on coinage tended to be a little conservative and behind the times. 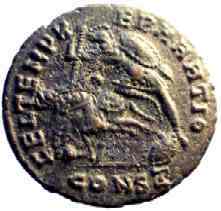 Dominus Noster does not appear in coins until late in the reign of Diocletian (i.e. early 300s AD). PF stands for Pius Felix, i.e. “Dutiful and Fortunate”. It is quite common, almost ubiquitous, on legends in the post Severan period (after 235 AD), and usually followed the name of the Emperor. AVG is the abbreviation for AVGVSTVS, the honorific name granted to the first Emperor (Octavian) by the senate in 27 BC. Subsequent emperors took on this name, as Octavian took on his adopted father’s name of Caesar, to associate themselves with their predecessor’s glory. In the Later Empire the title “Augustus” signified Emperor, and “Caesar” signified heir or second-in-command. So the gentleman portrayed on this coin must be an Emperor. This may seem like common sense, but the Romans were fond of portraying their Empresses and other members of the imperial family on coins. After we take out these titles, we are left with the name: Constantius. Unfortunately there are four men with that name who ruled the Empire: Constantius I (295-306 AD), Constantius II (337-361 AD), Constantius Gallus (355-358 AD) and Constantius III (several months in 421 AD). Once again, although this coin is only good Fine condition, the portrait is quite clear and the elements are easily distinguished. It shows the stylised features of youngish man wearing a band across his head, with some sort of drapery and armour around his shoulders. The band around the head is what is known as a diadem, and there are several flavours. The diadem was a strip of fabric tied about the head to signify kingship and was introduced by the Hellenistic monarchs who succeeded Alexander the Great. However, the diadem was not generally used by the Romans until after the reign of Constantine (337 AD and onwards). Previously a laurel wreath or a radiate crown was worn on obverse portraits. Portraiture on Roman Coins has generally been pretty accurate. Coins of Nero, for example, do little to hide his chins and the coins of Maximinus I, as another example, almost proudly portray his prominent chin. Between emperors it took some time for the mints to adjust to their new ruler and we have coins, say of Trajan, who looks uncannily like his predecessor Nerva. In the Later Empire we see less accuracy and more stylising in the portraits on roman coins. Have we got enough information to pinpoint the ruler depicted on this coin? We have his name (Constantius) which narrows the field to the four stated above. In addition two factors have pointed out: The title of Dominus Noster, and the diadem worn on the portrait. Both these factors point to the coin dating after the reign of Constantine the Great. Since Constantius I was Constantine’s father and reigned from 294 – 306 AD, he can be safely dropped. We have also discovered that the portrait is of an Augustus, i.e. Emperor, which leaves Constantius Gallus out as he only reigned as a Caesar. This leaves only Constantius II and Constantius III. Of these two, it would be a safe assumption to say that it is Constantius II, who reigned for twenty-four years, rather than Constantius III who reign for not even a full year (hence his coins are rarer and more expensive). Additionally the Roman Imperial Coinage does not list any bronze coin type for Constantius III, only gold. We can discover from any history book that Constantius II was one of the three sons of Constantine I the Great. He had been “Caesar” under his father since 324 AD, and jointly inherited the Empire with his brothers on Constantine’s death. Constantine II (the eldest) was granted the Western portion of the empire: Britain, Gaul and Spain; Constans (the youngest) got Italy, Illyria and Africa; and Constantius II got the Eastern Empire: Asia and Egypt. Their relationship was far from amicable, however. 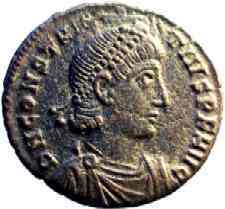 Constantine II invaded his youngest brother’s territory in 340 AD, but was killed in the fighting. The Empire was re-distributed between Constans and Constantius. Then Constans was killed by a usurper, Magnentius, in 350 AD. Before Constantius could march to avenge his brother’s death, he appointed his young cousin Constantius Gallus as “Caesar” for the East. After defeating Magnentius in 353 AD, Constantius discovered that his cousin had been abusing his power and plotting against him. He had Gallus captured and executed. When the German tribes began pressing against the West again, Constantius appointed Gallus’ younger half-brother Julian as “Caesar” for that region in 355 AD. However, after being continually pressed for men by his overlord, Julian revolted. Constantius marched against his Caesar, but died en route, in 361 AD. Which is short for FELIX TEMPORVM REPARATIO, or “a happy renewal of times”. The veracity of this statement is indeed questionable, as even a brief read of the history of these times relate. Quite clearly a soldier standing to the right of the reverse can be seen spearing a fallen horseman. There is a common description for this in more general reference books such as Sear’s Roman Coins and Their Values: a Roman soldier spearing a fallen Persian horseman. Together with the legend, the reverse is revealed as archetypal propaganda. It says "The Restoration of Happy Times" or popularly "Happy Days Are Here Again", because we are victorious against our Persian enemies. The truth of the matter was very different. Although some minor victories had been made against the Persians, at least as many defeats are recorded as well. And the general Roman population, with barbarian and Persian threats on the frontiers, escalating inflation, religious strife etc would surely have taken umbrage at being told that the Government had brought back the prosperity of yesteryear. The exergue, the area at the bottom of the reverse, was quite often used in the Later Empire to record the mint and workshop that made the coin. This was most probably so that the government could trace underweight coins to the people that made them. The exergue for this coin reads CONSZ, and this needs some decoding. Both the mint and the workshop (called officinae) are recorded on Later Empire exergues, but which is which? The officinae sometimes comes before the mintmark, sometimes afterwards. Sometimes at the start of the exergue we sometimes find the letters “SM”, which stand for “Sacra Moneta”. These can be ignored, and are not part of the mintmark or the officinae. Other symbols can also be found, perhaps used as anti-counterfeiting devices. These too can be ignored, except for when referencing against a detailed catalogue, such as the Roman Imperial Coinage (see below). In our example we can see quite clearly the mintmark is the first part: CONS, which stands for Constantinople, and the officinae is the Z, which stands for the sixth workshop. Now we know the period, we can have a go at determining what the denomination is. For the Later Roman Empire quite often the names of the denominations are not known, and bronze coins are categorised by size: AE1 for those coins measuring over 24 mm, AE2 for those between 24 and 21 mm, AE3 for those between 20 and 17 mm, and AE4 for those under 17 mm in diameter. Our coin is definitely bronze, or some other base metal, and measures about 18mm in diameter and weighs 2.3 grams, so it would be classified as an AE3. 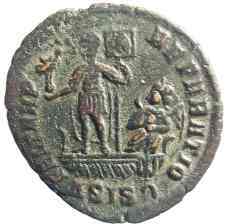 However, reading a general reference work on roman coins, such as Sear, we find that during the reign of Constantius II a series of larger AE2 with the legend FEL TEMP REPARATIO were first issued, known today as the centenionalis or sometimes as a maiorina. There is some academic argument as to whether there were three denominations or two over this period. For simplicity’s sake, I will refer to it as a centenionalis. The centenionalis was introduced jointly by Constantius II and his brother Constans in 248 AD to mark the 1100th birthday of the city of Rome, as it was traditionally reckoned. Initially it was large, 23 mm in diameter and around 5.2 grams in weight, but a half-centenionalis was also minted. The larger coin was either gradually reduced over time in size to about 16mm in diameter and around 2.45 grams in weight or replaced by the smaller denomination. Judging by the diameter and weight of this particular coin, we can see it is an example of a centenionalis towards the end of the series. Soldier leading a small figure from a hut. Victory steering the Emperor in a boat. Emperor standing before two captives. Emperor on horseback thrusting spear at enemy on foot. Phoenix on rock or globe. Even the soldier spearing fallen horseman type has a number of varieties. Subtly many of the fallen horsemen have different characteristics such as beards, caps or helmets. It has been proposed that each different variety stood for a different enemy of the Empire, ie Persians, numerous German tribes etc. Constantius II (c 353 AD) bronze centenionalis; 2.3gms, 18mm. Obv: DN CONSTANTIVS PF AVG, diademed head right. 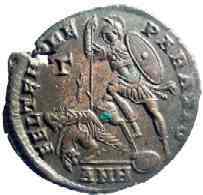 Rev: FEL TEMP REPARATIO, Roman soldier spearing fallen Persian horseman, CONZ (in exergue). Good Fine. RIC 119. Now we have all these details, we can use a more detailed catalogue, the most popular being Roman Imperial Coinage (RIC) to correctly reference the coin. RIC is a ten volume series covering the entire range of Roman Imperial Coins to a fairly exhaustive degree. It is expensive and not generally owned by those with only a passing interest in Roman coins, but if you are lucky a library near you may stock it. Until Volume VI (Diocletian’s reform of circa 297 AD), RIC was broken down by each emperor chronologically, then by mint. From Volume VI onwards, RIC is broken down geographically by mint for each volume. The volume covering the family of Constantine (and thus our coin of Constantius II) is Volume VII. Luckily our exergue is clear enough for us to identify the mint: Constantinople. Under each mint, the coin types are broken down by periods, and, within that, denominations: from gold to silver to base billon and bronze. Our obverse legend DN CONSTANTIVS PF AVG has a break between the N and T in Constantius, making it Obverse Legend Cs1 in RIC. The obverse depiction shows the emperor draped and cuirassed wearing a pearl diadem, and this is type D3 in RIC. Our Reverse type best matches FH4 – “a helmeted soldier to left, shield on left arm, spearing fallen horseman; shield on ground at right. Horseman is beardless and wears cap; he falls forward on neck of horse”. There are no symbols behind the bust on the obverse, and none in any of the reverse fields. Under Constantinople mint and on page 458 we find the reference that matches our coin’s description, mint, size and weight: 119. 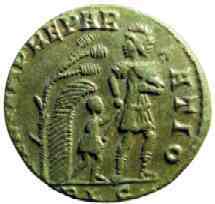 RIC also indicates its rarity: S for Scarce, and the period it was minted: between 15 March 351 to 6 November 355 AD. For those unlucky enough to not have access to a copy of RIC, Roman Bronze Coins by Victor Failmezger is a more affordable reference work for this period. Failmezger, V. Roman Bronze Coins, Ross & Perry Inc, Washington, 2002. Mattingly, Harold. Fel Temp Reparatio, Numismatic Chronicle Reprint Series, 1977. Sear, David. Roman Coins and Their Values, Volume I and II, 2002. Sutherland, C H V and R A C Carson. Roman Imperial Coinage, Volume VIII, Spink and Son, 1981.